With each passing day, global mobile traffic is increasing at a rapid pace. That's why publishers are making responsive and mobile-friendly websites to cater to the needs of this audience. There's also a huge revenue generation opportunity through ads designed specifically for mobile platforms. If you're receiving a decent volume of mobile traffic, you can serve lucrative mobile ads to skyrocket your earnings. There are dozens of popular ad networks that specifically cater to mobile segment advertising opportunities. The entire mobile ad networks presented here accepts publishers to monetize their website's mobile version. Depending on your needs, you can select the best one from the collection that provides you with the right kind of mobile ads and the revenue share. I've been using four mobile ad networks from this list. 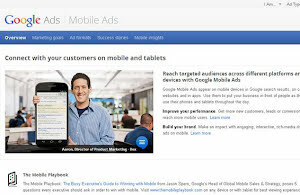 Google Mobile Ads - Google is an undisputed leader in CPC advertising whether it's for desktops or for the mobile platform. If you're looking to monetize your mobile traffic, AdSense provides you with ample options to serve custom mobile ads for your website. Various studies have suggested that publishers were able to increase their earnings significantly after using mobile ads from Google's mobile ad network. Since the advertisers' base for AdSense is huge, you have tons of options to monetize every niche website. Mobile ads available through Google mobile ads are interactive and support several media formats. This increases the CTR rate if the placement is right and is complemented with a clean and unobtrusive mobile website design. InMobi - This popular ad network provides both CPC and CPM mobile ads for the publishers. This is ideal for both low as well as high traffic websites. It has a sophisticated ad delivery system that senses the context of the mobile web page to serve the most relevant ad. This also helps in delivering the highest CPM advertisement. You also get access to powerful analytics dashboard to monitor the ads performance. This helps you in optimizing the placements. It has a wide array of mobile ad formats to choose from. This enables you to integrate these ads very easily into different kinds of layouts. Its rich media ad library gives maximum possible returns for your premium ad placements. Integration of its ad SDK is very easy. Mojiva - Apart from regular mobile ads for the publishers, this excellent service also provides real-time analytics dashboard to track the performance of all the ads on your mobile website. Its context-sensitive ad delivery system serves the most matching ads for higher click-through-rate. Different ad formats let you embed them easily at the targeted locations on your website. It provides detailed conversion tracking and several other important metrics to fine tune the ad customization and placement. Publishers can also apply various attributes for targeting different segments of mobile traffic for higher returns. It has one of the most sophisticated and detailed reporting modules to track your ads and earnings in an easy way. AdIQuity - This is yet another popular and profitable mobile ad network for the publishers. It has a unique ad delivery algorithm that serves the highest paying ads on your mobile website. Unlike other mobile ad networks, this one has a track record for timely and accurate payments to the publishers. Its analytics system provides detailed statistics about each active advertisement on your website. If you're not able to implement the ads correctly, their dedicated support system responds quickly to solve your queries. It is integrated with over three dozen different ad networks to provide you with a rich array of mobile ads. It serves rich media ads to a global audience and supports all major mobile platforms and brands. mMedia - This is an ideal solution for developers who publish apps for different mobile platforms. You can easily monetize your existing applications through its powerful SDK for delivering high-quality mobile ads. It supports apps developed for iOS, Android, Windows Phone, BlackBerry and several other popular platforms. Developers can easily create video and rich media interactive ads that gels completely with a mobile app through its flexible SDK library. Through it, you can also run in-house ads that promote your similar apps or the paid version of an existing app. This gives you more flexibility in designing different variants of a fully monetized application. You can also integrate 3rd party ads through mMedia. Komli Mobile - I'd highly recommend using this mobile ad network as it provides top-notch services for good publishers. It provides different types of ads for your website viz., CPA, CPM or CPC. Depending on the quality of mobile traffic you're receiving, you can opt for the most lucrative option to get the best possible returns. It has a unique manual ad approval system that lets you handpick select ads that can be served on your mobile website. Its in-house ad serving system lets you populate the unfilled ad slots with your own campaigns or 3rd party ads to completely utilize the available real estate on the web pages. It provides three different ways to serve ads on your mobile properties giving you the required convenience and flexibility. Vserv - Its cloud-based ad hosting platform provides a robust mobile ad network to monetize your mobile websites. Due to their relationships with a large number of service providers and original equipment manufacturers across the globe, you get huge opportunity to tap the massive user base for maximum returns. This ad network also supports real-time reporting with a strong ad filtering mechanism so that you can allow only the best ads on your mobile web properties. Whether it's regular mobile traffic using mobile browsers or a monetized mobile application, you can use all the available options to raise your earnings through all the possible channels. Its widgetized dashboard helps you maintain your account in an easy way. LeadBolt - It is one of the few mobile ad networks that offer up to 10 different variations of ads for applications. This also includes highly-converting audio ads. Since the advertisements offered by this network are different from regular banner ads, the eCPM is very high. It also has a unique automatic ad optimization feature that senses the performance of your various ad units and optimizes them without any user intervention to get the highest possible returns. It also has an advanced segmentation tool in its analytics dashboard so that you find the best conversions based on different metrics. Its powerful and flexible SDK helps you integrate and deliver all 10 different types of ads on almost every major mobile platform. Verve Mobile - If you want a feature-packed mobile ad manager, then you can rely on this popular service. You can use its reliable ad serving technology to not only display regular ads from the marketplace but can also use it to manage your inventory. Ads delivered through this ad server are location-aware and are highly context-sensitive so that your traffic receives the most relevant ads. Publishers also get access to a premium marketplace where they can select the ads that they want to be served on their mobile web properties. The eCPM is very much competitive giving excellent returns to premium publishers that have quality mobile traffic. You also get a quality support system with your account to get started as quickly as possible. Jumptap - I've found this mobile ad network extremely flexible and user-friendly. After account creation, publishers simply have to generate the ad code to paste it into the desired location on your mobile website. The generated money is immediately credited and reflected in your account's reports without any delay. Premium publishers with quality traffic are given more advanced monetization options for much higher returns. The ad serving system is completely context-sensitive so that your mobile traffic is not annoyed by irrelevant advertisements. Its automated system frequently monitors the ad and inventory performance within your account to optimize the active ad units on your mobile web properties. Mobhero - Publishers can monetize both websites and applications through this popular mobile ad network. It offers very high eCPM and the earnings are credited in real-time to the publishers' accounts. This network also has a powerful real-time reporting system to track the progress of all the installed ads on your mobile properties. You can also filter ads to give the best and the most relevant ads to your visitors. The filtering can be done for keywords, domain names and ad categories. This gives you enough flexibility to effectively control which ads should be served on your mobile website. Its analytics dashboard also includes ad performance visualization on the basis of geography to find out the lucrative locations. Velti - This mobile ad network has one of the most flexible ad-filtering systems among its competitors. Its real-time ad bidding mechanism allows advertisers to compete for premium ad slots available on your mobile website. Based on your past analytics and generated revenue data, this ad network delivers the most matching advertisements to give you higher returns. Publishers also enjoy the benefit of getting quick and consolidated payments through a single check to easily track their earnings data. Premium publishers with a large volume of mobile traffic get dedicated account manager to guide you in every aspect of monetization. They also get the facility and infrastructure to sell mobile ads directly to private advertisers. TapIt - Publishers can benefit from the real-time bidding system supported by this hugely popular mobile ad network. It also offers large full-screen ads that have very high click-through-rates and equally high eCPM. Its location-aware rich media advertisements not only gives you better earnings but also gives unobtrusive browsing experience to the visitors. Its unique ad mediation system lets you engage and connect with advertisers of your choice to come up with lucrative advertising deals for the best possible returns. Publishers with high mobile traffic can also sell their mobile ads directly to the interested advertisers. It also offers a reporting-API to fetch and store your analytics data at a convenient place for advanced analysis. Airpush - If you're publishing high quality Android apps in the marketplace, then this popular SDK can monetize them very easily. It has a large advertisers' base and provides rich media ads with very high CPM. A developer can integrate the advertisements very easily without any need to write large and complex code. It has an outstanding 90%+ fill-rates giving you maximum earnings from the premium space available within your Android apps. Its innovative push ad technology delivers the advertisement directly into the top notification tray even if the app is not in active use. You can also use its popular full-page ad formats to further increase your earnings by displaying them at specific events while the application is in the active state. MobFox - This intuitive mobile ad network offers some interesting and unique features for the publishers. You can set the minimum CPM and CPC prices for each of your active ad slots so that they are not occupied by low paying ads. Publishers are also allowed direct access to advertisers from more than two dozen external ad networks. This helps publishers sell their premium ad space very easily. The ads served through this network are compatible both for smartphones and tablet devices. Publishers can use both SDK and API to integrate the ads on their mobile website. You can also sell direct ads through this network to get the desired price for premium ad slots. Its account management interface is very good and user-friendly. adMobile - This popular mobile ad serving network delivers context-sensitive advertisements that move and resize themselves while the visitor is browsing the mobile web page. This avoids any kind of obstruction and at the same time keeps the ad in proximity for better click-through-rate. You can even control the color and transparency level of each active ad on your mobile web property. It also offers unique in-ad search features that let visitors find out secondary or associated products from within the active ad on the web page. You can also customize the ads in such a way that they either remain fixed at a position or scroll along with the web page. You can even make them disappear after the specified time is over. Smaato - Its self-service ad network is ideal for small to medium-sized publishers with decent mobile traffic on their websites. It has a robust ad space management system that lets you create, edit and promote the available ad slots in the marketplace. Its powerful reporting system provides you with interactive charts and data related to important KPIs. It also includes important demographic data for better analysis of various ad slots. Publishers also have the option to export the report's data in Excel format for offline analysis. It supports all major mobile operating systems and also offers generic ad code that can be used on any platform. It also has an API for advanced publishers to integrate ads conveniently. AdTwirl - You can start serving ads on your mobile website within minutes of creating an account with this mobile ad network. It has a real-time reporting system that records impressions, clicks and your earnings. You can also show free ads to earn points that can be used to run your own advertising campaigns within the network. You also get different types of ad script code to easily integrate it within your mobile web property. The ads are served on the basis of past performance and the historical analytics data. The ad serving system also takes advantage of the user targeting system to serve the best and the most relevant ads to the targeted mobile traffic. Publishers can easily generate ad code from their account dashboards. mkMob - Like any other sophisticated and advanced mobile ad network, this one also provides multiple ad formats with real-time reporting for the publishers. It also has a flexible ad filtering system to remove low paying or irrelevant ads. It also gives you the flexibility to transfer your ad earnings directly to your advertising account to run your own mobile ad campaigns. Publishers can also use both client-side and server-side ad serving API to monetize large and complex responsive websites in a better and efficient way. You can also use its powerful J2ME SDK for serving ads on your mobile web properties. With high fill rates and eCPM, publishers get complete value of the available ad slots at the premium locations on their mobile website. Ybrant Mobile - Publishers offering varying size of multiple ad slots on their mobile websites can use this ad network. It supports both text and banner ads of different dimensions for all standard screen sizes. Publishers can also serve lucrative video ads on their websites. Its unique targeting system uses both demographic and visitors behavior data to serve contextual ads for higher click-through-rate. You can also get support for building custom mobile landing pages and websites for better conversions. Its automated ad optimization system automatically serves best possible advertisements based on the data captured by previous ad campaigns. You can also monetize your applications through this popular mobile ad network. MoPub - Unlike other mobile ad networks, this one also offers flat rate ad slots for the publishers. It offers a wide array of mobile ad formats which runs seamlessly both on smartphones and tablets. It also offers optimized video ads for mobile websites primarily hosting video content. Its real-time analytics dashboard lets you view the countries giving you the highest returns. This way you can focus on developing mobile traffic from select parts of the globe. Its automatic payment system gives a peace of mind to the publishers as they receive their hard earned money in a timely manner. The ad integration is available in several programming languages so that you can easily embed the ads at the desired location without any hiccups. Inneractive - This popular mobile app monetization network provides killer tools for the developers who publish applications for widely used mobile platforms. Its rich SDK provides flexible tools to easily integrate rich and interactive advertisements within your mobile application. Developers can find dozens of premium advertisers to collaborate with so that they can get the best possible rates for the space available in their apps. The management interface is also good with easy-to-understand wizards. It also offers a private exchange option to help developers create platform independent apps so that they can get more ad serving opportunities on different mobile devices. It's one of the best mobile app monetization systems available for developers. AdMob - And last but not the least is Google's AdMob mobile app monetization platform for seasoned developers. You can easily install its SDK and can deliver the relevant ads within your application. AdMob provides platform independent ads that work perfectly well even on tablet devices. It also offers search ads for mobile devices to earn revenue from custom searches made by your app users. Through its flexible ad mediation system, developers can also pull ads from external ad networks without any hiccups. Its powerful monitoring dashboard lets you track different segment of mobile traffic in one place. All the revenue generated through AdMob is directly transferred to your bank account, once the payment threshold is reached.